Are your kids playing Fortnite? If not, you've probably heard them talking about it. Since it's such a popular game, we're providing a great overview from Common Sense Media on what the game is, and other information for parents to know! Fortnite is a video game for PlayStation 4, Xbox One, Windows, Mac, and mobile that takes elements from sandbox-building games and adds the fast-paced action of a third-person shooter. 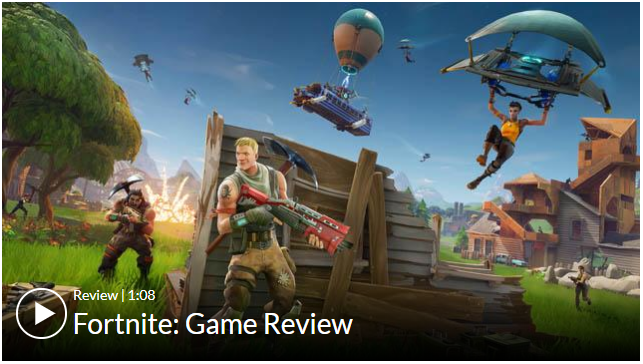 There are two modes to the game: a solo version called Save the World and the hugely popular multiplayer version called Battle Royale. For some parents, the cartoonish, bloodless style of the action in Fortnite makes the violence less problematic than the aggressive gore in other popular shooter games. But the game's online chat feature -- especially in Battle Royale -- could expose younger players to offensive language or mature content from random strangers. Common Sense doesn't recommend games with open chat for kids under 13, but with the right controls and parental guidance, this can be a tween-friendly alternative to violent first-person shooters. Fortnite is available on PlayStation 4, Xbox One, Windows, and Mac. Users need an internet connection to play. A mobile version is also available for iOS and Android. Players can play "cross-platform," which means a Windows player can be on a team with a console player, for example. When each match only takes 20 minutes, it's easy to fall into the trap of "just one more" -- sort of how you end up binge-watching an entire season of Stranger Things. But you can take advantage of the quick matches by using them as a natural stopping point in gameplay. Some kids benefit from using a timer, or limiting themselves to a certain number of matches per day. Check out more screen-time management techniques from Common Sense! Need more information on privacy settings for game consoles? The Entertainment Software Rating Board (ESRB) is a great resource! Parental controls allow parents to help manage their children's video game use, even when they're not around. Available for all current consoles, handhelds, smartphones and computers, they can be activated to block games by age rating. Certain device settings even allow parents to restrict access to the Internet, disable in-game purchases, regulate the amount of time your child can play and more. The ESRB has guides to on how to activate the parental controls on your game system(s). Check them out at esrb.org!